The first half was all Steelers as they opened with two Chris Boswell field goals, and later added a Le’Veon Bell touchdown rush and a touchdown pass from QB Ben Roethlisberger to WR JuJu Smith-Schuster to go into halftime up 19-0. The Ravens would get on the scoreboard in the third quarter, scoring nine points on a field goal and a QB Joe Flacco touchdown pass to WR Mike Wallace with a failed 2-point conversion. However, that would be all the points they could notch, and the Steelers would go on to 26-9 victory. With that, we give you our PFF exclusive takeaways from the contest for each team. Bell’s patience and burst were on display on against the Ravens. The Steelers handed him the ball a whopping 35 times, and he gained 144 yards with nearly half of that coming after first contact. 104 of his rushing yards game on runs where he hit a gap outside the tackles, as he averaged 6.1 yards per carry on those runs, compared to just 2.2 yards per carry between the tackles. Bell also forced six missed tackles as a runner, equaling his total in the first three games of the season combined. Brown was kept relatively quiet on the day with just four catches for 34 yards. He also had the odd play where he couldn’t hold on to the ball all the way to the ground that ended up as an interception. Brown’s longest catch went for 14 yards, the first time he did not have a catch of at least 15 yards since Week 7 of the 2013 season, also against the Ravens. His receiver rating of 30.4 was by far his lowest of the season. Heyward’s pass-rushing stats immediately pop (two sacks and two QB hurries), but it was his dominant run play that truly set him apart today. His 91.1 run-defense grade was the best for either squad on the day, as he consistently dominated the line of scrimmage. Shazier was a frequent target in coverage today, and more than held his own. While he gave up nine receptions on 12 throws into his coverage, he did not give up a completion longer than 11 yards. He also broke up one Flacco pass and intercepted another, and for the game had 10 solo tackles and two defensive stops. Flacco’s receivers didn’t help him very much (they dropped five passes), but he struggled throughout the game with his timing and rhythm. 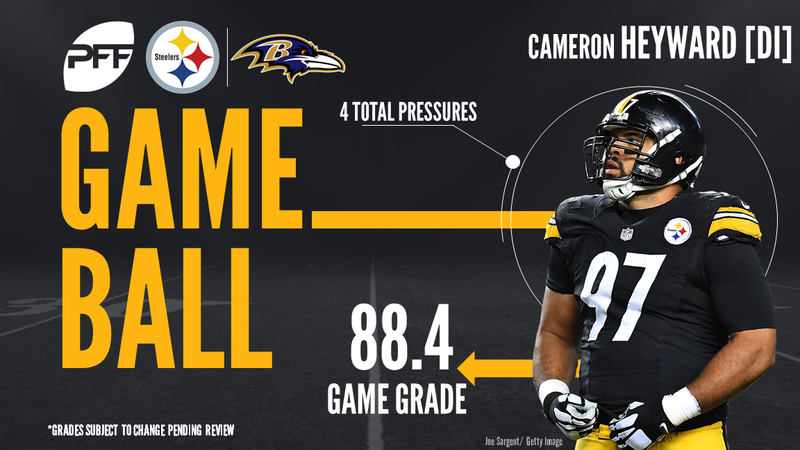 The Steelers’ rush gave him fits, as he took four sacks and had a passer rating of just 35.8 on 14 drop-backs on which he saw pressure. Skura took 52 reps at right guard and Eluemunor had the other 17, and both had massive struggles. Both posted overall grades under 40.0, in large part because they combined to give up two sacks, two hits and three hurries in pass protection. Pierce was a monster in run defense with a game-high six defensive stops, matching his total through the first three weeks combined. He also had a hit and a hurry on Steelers QB Ben Roethlisberger, and has had at least two quarterback disruptions in every game this year from his nose tackle position. After seeing his first career snaps last week, Henry put together a better performance in his second outing. Henry rushed the passer 16 times, and hit Roethlisberger twice, pressured him once, and batted down two passes, with the second coming on third down to force a punt. The only bad play he really had in the game was jumping offsides and getting called for a neutral zone infraction on third and short to give Pittsburgh a first down.